Any user authenticated to Active Directory can query for user accounts with a Service Principal Name (SPN). This enables an attacker with access to a computer on the network to identify all service accounts supporting Kerberos authentication and what they are used for. Each SPN starts with a SPN type which is the first part of the SPN. If the SPN is “MSSQLSvc/adsmsDB01.adsecurity.org:1433”, then “MSSQLSvc” is the SPN type. We can check the ADSecurity.org SPN directory and see it’s for Microsoft SQL Server. The second part (after the forward slash /) is the server name the Kerberos service is running on. The server name can be the FQDN or the short name (often both). Sometimes there’s a colon (“:”) at the end which provides additional information, such as a port number or SQL instance. Anyone can perform “SPN Scanning” in order to identify Kerberos service SPNs registered in an Active Directory forest. Attackers are most interested in Service Accounts that are members of highly privileged groups like Domain Admins. A quick way to check for this is to enumerate all user accounts with the attribute “AdminCount” equal to ‘1’. I cover AdminCount in an earlier post (“Active Directory Recon Without Admin Rights“). This means an attacker may just ask AD for all user accounts with a SPN and with AdminCount=1. Once we have this data, we can filter further to identify the Service Accounts. AGPMServer: Often has full control rights to all GPOs. MSSQL/MSSQLSvc: Admin rights to SQL server(s) which often has interesting data. FIMService: Often has admin rights to multiple AD forests. 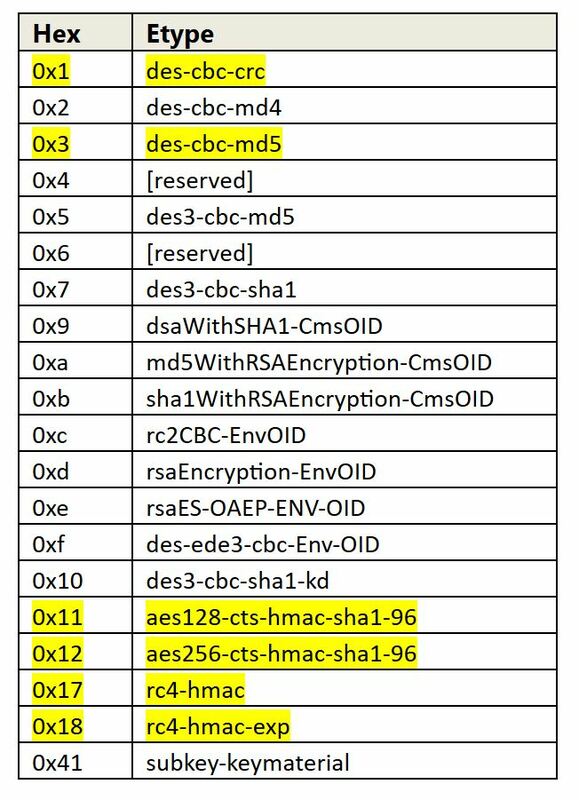 STS: VMWare SSO service which could provide backdoor VMWare access. Kerberoasting these SPNs could lead to attacker gaining access to the associated service account credentials, which would provide easy privilege escalation if the associated password isn’t long & complex (>25 characters) or if the associated service account isn’t configured as a Managed Service Account. This attack involves requesting a Kerberos service ticket(s) (TGS) for the Service Principal Name (SPN) of the target service account (Step #3 above). This request uses a valid domain user’s authentication ticket (TGT) to request one or several service tickets for a target service running on a server. The Domain Controller looks up the SPN in Active Directory and encrypts the ticket using the service account associated with the SPN in order for the service to validate user access. The encryption type of the requested Kerberos service ticket is RC4_HMAC_MD5 which means the service account’s NTLM password hash is used to encrypt the service ticket. Running klist shows the new Kerberos service ticket with RC4-HMAC encryption. The next step is exporting the Kerberos ticket we just requested from memory, which can be done easily with Mimikatz (without admin rights). Kerberoast can attempt to open the Kerberos ticket by trying different NTLM hashes and when the ticket is successfully opened, the correct service account password is discovered. The Domain Controller doesn’t track if the user ever actually connects to these resources (or even if the user has access), so a user can request hundreds of service tickets, even if they never actually connect to the service. Note: No elevated rights are required to get the service tickets and no traffic is sent to the target. Managed Service Accounts and Group Managed Service Accounts are a good method to ensure that service account passwords are long, complex, and change regularly. A third party product that provides password vaulting is also a solid solution for managing service account passwords. Though any 3rd party password management tool needs to be properly evaluated since the associated service account often requires Domain Admin level rights. This evaluation should also include how these credentials are managed within the solution. Before having a chance to detect Kerberoasting, it’s important to have the appropriate logging enabled. Kerberoasting involves requesting Kerberos TGS service tickets with RC4 encryption. 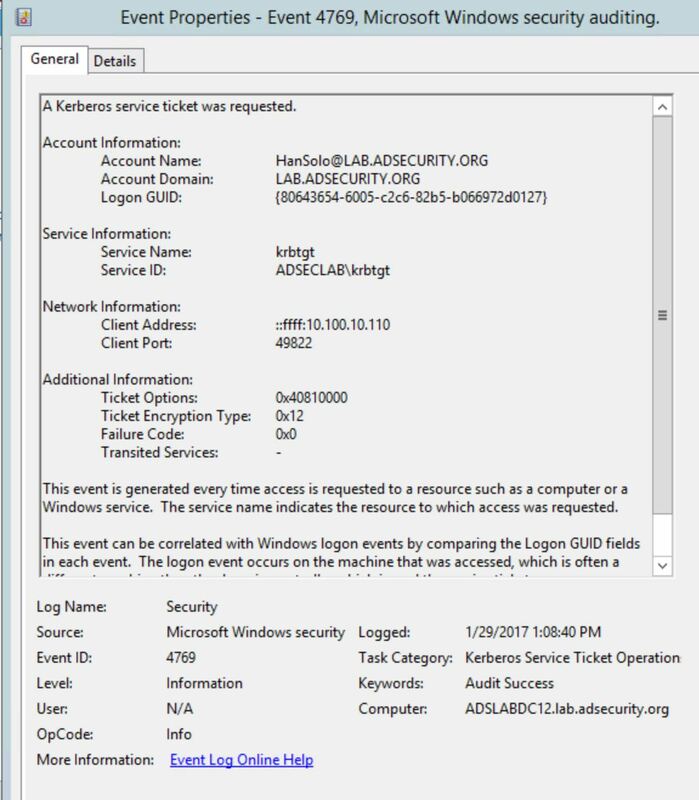 Domain Controllers can log Kerberos TGS service ticket requests by configuring “Audit Kerberos Service Ticket Operations” under Account Logon to log successful Kerberos TGS ticket requests. Event ID 4769 will be logged many, many times in the domain since after initial logon (and Kerberos TGT ticket request), users request Kerberos TGS service tickets to access the may services on the network (file shares, SQL, SharePoint, etc). Expect there will be around 10 to 20 Kerberos TGS requests per user every day. The 4769 event on Domain Controllers is one of the most numerous in any environment which is why it’s often not logged. Detection is a lot tougher since requesting service tickets (Kerberos TGS tickets) happens all the time when users need to access resources. Looking for TGS-REQ packets with RC4 encryption is probably the best method, though false positives are likely. 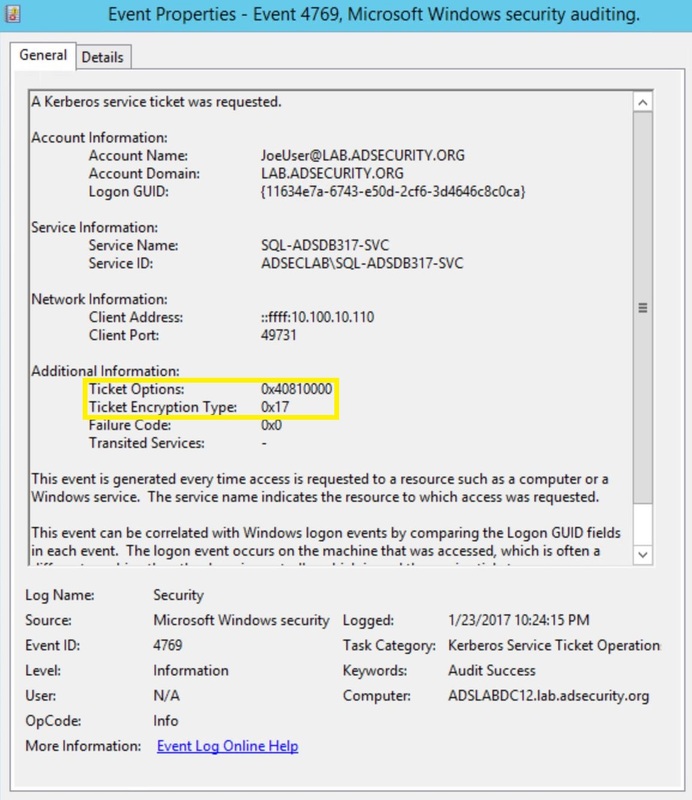 Monitoring for numerous Kerberos service ticket requests in Active Directory is possible by enabling Kerberos service ticket request monitoring (“Audit Kerberos Service Ticket Operations”) and searching for users with excessive 4769 events (Event Id 4769 “A Kerberos service ticket was requested”). Here’s how to definitively detect Kerberoasting activity. Windows added Kerberos AES (128 & 256) encryption starting with Windows Server 2008 and Windows Vista which means that most Kerberos requests will be AES encrypted with any modern Windows OS. Any Kerberos RC4 tickets requested should be the exception. There are systems that only support Kerberos RC4 by default (NetApp). Inter-forest Kerberos tickets also use RC4 unless configured for AES – ensure your forest trusts support AES and then enable AES over the trust. So, how do we determine what encryption type was used when looking at events: 0x12, 0x17…? Once all Domain Controllers are configured to log 4769 events, these events need to be filtered before sending the data into a SIEM/Splunk. Since we are only really interested in Kerberos TGS service tickets with RC4 encryption, it’s possible to filter the events. As shown above, Kerberos events with AES encryption has Ticket Encryption Type set to 0x12. Kerberos RC4 encrypted tickets have Ticket Encryption Type set to 0x17. With this information, we can start investigating potential Kerberoasting activity and reduce the number of 4769 events. Filter out requests for service names with a “$” which are typically for computer accounts (or trusts or Managed Service Accounts, all accounts where Windows automatically generates a long, complex password). In limited testing, I’ve seen 4769 event totals reduced from millions to thousands and hundreds using these filtering techniques. Some attackers will request a bunch of RC4 TGS tickets for some or all service accounts using something similar to the following graphic. The PowerShell script code in the graphic above is similar to PowerView functionality. The next graphic shows the results of the PowerShell script code being run. Running klist shows the tickets are in user memory. Note that the initial krbtgt ticket is AES encrypted and others are RC4-HMAC(NT). That’s a bit unusual. So, the tickets were requested… How to discover this activity? 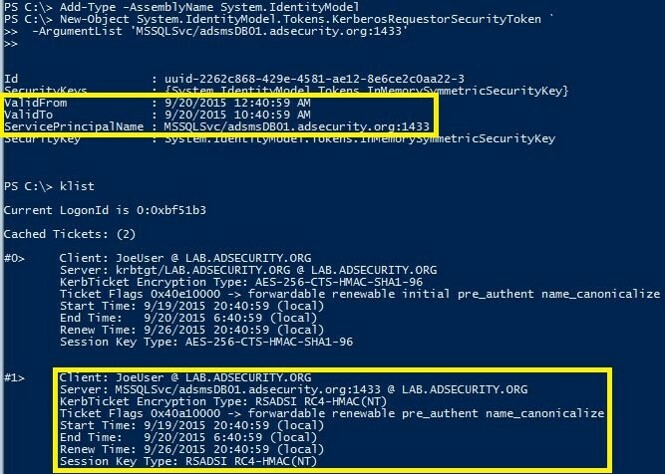 Using the information regarding ticket encryption type and ticket options, we can use PowerShell to parse the DC’s event log looking for 4769 events with this info. That looks really odd. Why would any account request several different service names (Citrix PVS, BizTalk, Business Objects, AGPM GPO management, and several SQL service accounts) within a second or two of each other? That stands out and looks really suspicious and is very likely Kerberoasting activity. This provides great information on what users could be compromised and what activity on which computers should be scrutinized. A single user requesting RC4 encrypted TGS tickets for several services, such as lots of SQL service principal names is suspicious and it’s worth investigating the IP (client address) the requests came from. The same thing is true for multiple RC4 encrypted TGS requests over time for lots of service principal names. A pattern does emerge when there’s one or two accounts that request a variety or RC4 TGS tickets. If you are logging PowerShell activity, you can use my offensive PowerShell indicators to detect standard use of common PowerShell attack tools. 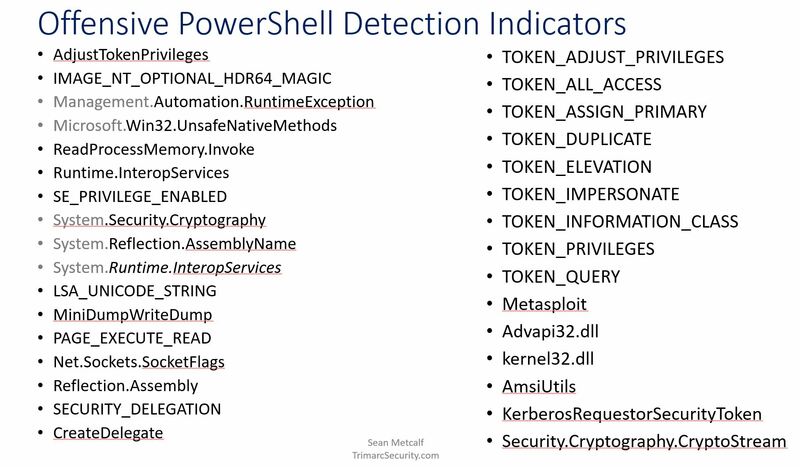 I cover detecting offensive PowerShell in the previous post “Detecting Offensive PowerShell Attack Tools” & “PowerShell Security: PowerShell Attack Tools, Mitigation, & Detection“. I also covered PowerShell security in my BSidesCharm & BSidesDC talks in 2016. 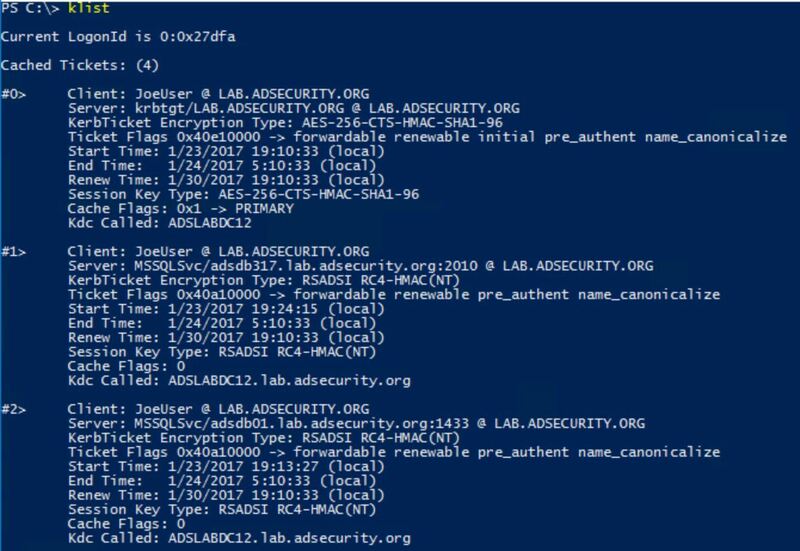 Note the addition of “KerberosRequestorSecurityToken” which is the PowerShell method to request Kerberos tickets. Kerberoasting requires requesting Kerberos TGS service tickets with RC4 encryption which shouldn’t be most of the Kerberos activity on a network. Logging 4769 events on Domain Controllers, filtering these events by ticket encryption type (0x17), known service accounts (Account Name field) & computers (Service Name field) greatly reduces the number of events forwarded to the central logging and alerting system. Gathering and monitoring this data also creates a good baseline of what’s “normal” in order to more easily detect anomalous activity. 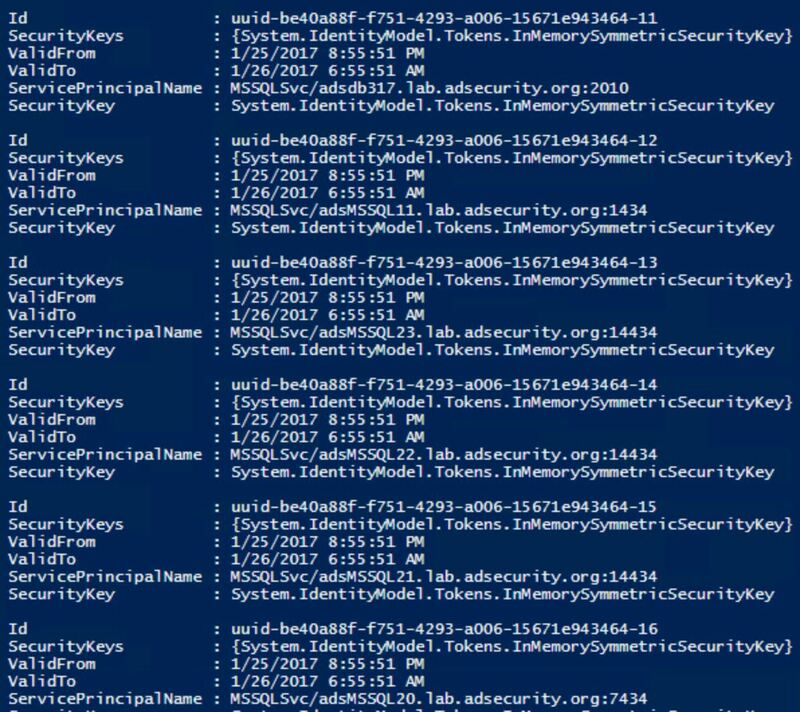 Tim Medin’s DerbyCon “Attacking Microsoft Kerberos Kicking the Guard Dog of Hades” presentation in 2014 (slides & video).